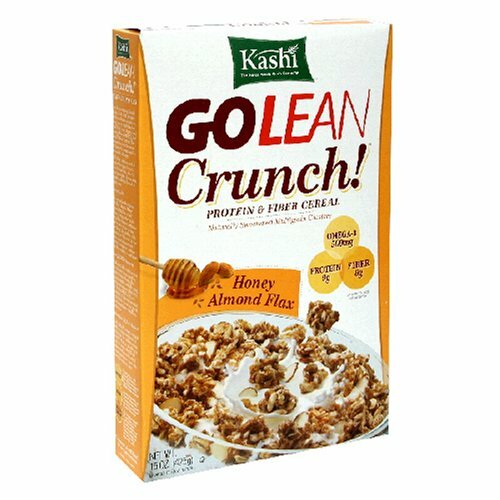 I am a huge fan of Kashi's other cereals and granola bars, but this cereal is just not up to par. It's just sweet enough, but is lacking that honey flavor. It's also dry and boring, compared to the original GoLean. Whole hard red winter wheat, long grain brown rice, barley, triticale, oats, rye, buckwheat, sesame seeds, evaporated cane juice crystals, soy protein concentrate, brown rice syrup, chicory root fiber, almonds, whole oats, whole flaxseed, expeller pressed canola oil, honey, salt, natural flavor, mixed tocopherols (natural vitamin E) for freshness. Contains wheat, soy, and almond ingredients. 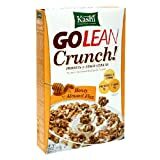 If you plan to purchase "Kashi Go Lean Crunch - Honey Almond Flax" from your supermarket, you can probably add a star to this rating. It will have a longer shelf life and probably be quite a bit cheaper. Also it does taste good and is pretty nutritious and healthier then many sweet cereals out there. It taste like a grown up version of Post Super Golden Crisp. I bought this 4 pack when it was on sale here in the Gold Box deals. It did come out to be a much better deal then the regular price here, which is far above my local grocery store. Also last time I was at the store I checked and the expiration date was a good way into 2009, this 4 pack(which should last a while) expires in just a few months. To me it went too far beyond crunchy. It was so hard, it reminded me of biting into corn nuts, and frankly was worried about my teeth. I'm not sure if what I received was stale or that is the normal texture. I am on my second box and it is the same as the first. On the plus side, besides that it tastes good(pretty sweet), it is low in fat, has no cholesterol, is high in Protein, and has a good allowance of iron(8%). For those watching their sodium intake this cereal has 140 mg per serving. The sugar count is 12 grams - but uses evaporated cane juice crystals - it's a good source of fiber(8 gms total) and Omega-3 and is a multigrain cereal. Normally I don't like Flax, but it is really good for you, and in this cereal I liked it. And for those those who like it very crunchy - I don't think you would ever have to worry about these becoming soggy in milk. But i would recommend to try just one box from your local market first. So I give it 2 stars for something nutritious that actually tastes good, but the price is too high here, and if I am going to buy something in multi-packs, I'd like the shelf life to be just a bit longer(and also something a little chewier). Ah, just what I needed from a food product: to stop breathing, have every inch of my skin and mucous membrane (everywhere) itch beyond belief and a loss of consciousness. Great Price! Best Cereal! Fresh! DO NOT buy this from AMAZON! why would anyone buy this here?